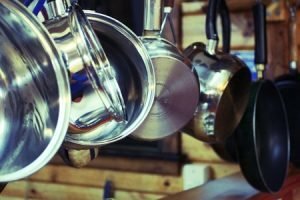 Ingredient Watch List: Aluminum and Breast Cancer—Is There a Connection? Annmarie Skin Care > Ingredient Watch List > Ingredient Watch List: Aluminum and Breast Cancer—Is There a Connection? Many people have recently become concerned about the potential hazards of aluminum in personal care products, mainly in deodorants and antiperspirants. Specifically, a study published in 2005 questioned whether or not absorption of aluminum salts near the area of the breast may increase the risk of breast cancer. Is this a real concern? Should we stop using our regular antiperspirants because of it? You're confident your antiperspirant works, but is it safe? Aluminum is an abundant metallic chemical element—in fact, the third most abundant element on the earth after oxygen and silicon, and the most abundant metal in the Earth's crust. It was first used commercially for cookware, because it is lightweight, nontoxic and easily formed into shapes. It's also used in the processing and storing of food, in water treatment facilities, and in the pharmaceutical and medical industries. Aluminum salts are used as the active ingredient in underarm cosmetics, but the effects of widespread, long-term and increasing use are unknown. According to researchers from the University of Reading, U.K., clinical studies have shown a disproportionately high incidence of breast cancer in the upper outer quadrant of the breast. The scientists acknowledge that aluminum is capable of causing both DNA changes and genetic changes that could, theoretically, play a role in causing cancer. The researchers also noted that estrogen is a well established influence in breast cancer, and that results demonstrate that aluminum chloride or aluminum chlorhydrate can act as hormone-disruptors, interfering with the function of estrogen receptors of human breast cells. The study authors concluded that further studies are needed to determine the long-term affects of aluminum exposure. One of the main questions is whether or not the skin can absorb the chemical, and if so, how much? A later study in 2007 again added to the evidence that the aluminum content of breast tissue and breast tissue fat was significantly higher in the outer regions of the breast, close to where we would normally apply antiperspirant. Researchers cautioned, however, that more studies are needed: “However, we have no direct evidence that the aluminum measured in these breast biopsies originated from antiperspirant. An alternative explanation might be that tumourous tissue acts as a ‘sink' for systemic aluminum.” In other words, we are exposed to aluminum from many sources, and the body may simply favor storing it in these areas. Still, the scientists commented that aluminum has shown to be carcinogenic, and that the confirmed presence of aluminum in breast tissue biopsies highlights its potential as a possible factor in the formation of breast cancer. The ACS goes on to note a study published in 2002 that compared 813 women with breast cancer with 793 women without it, and the researchers found no link between the disease and the use of antiperspirants or deodorants. The organization states that razor nicks may increase the risk of skin infection, and that if underarm skin is already broken or infected, it is possible that some antiperspirants could provide slight irritation, but it's unlikely that this is a major source of carcinogens that get into the body and reach breast cells. Is That Enough to Provide Safety Assurance? So what the agency is saying is basically that according to the limited research on this matter so far, they are seeing no connection, but that provides little reassurance of safety. We've seen many occasions where additional scientific research presents new evidence. I believe it's much better at this point to limit exposure to this ingredient rather than continue to use it until some agency receives the funding to finally thoroughly study the issue in a large population, over time. It's only when we have the results from such a large, well-done study that we'll be able to feel like the ingredient is safe for repeated use over a lifetime. Of course, there are aluminum-free alternatives for underarm cosmetics. A simple Google search will bring up many options. (Crystal deodorants are especially popular.) Many women complain, however, that on stressful days in particular, they just don't work to block body odor. Since it's all about reducing cumulative exposure, the solution may be as simple as using your aluminum-free option on some days, and resorting to your antiperspirant when you need to. Refraining from shaving right before applying the product may also help limit skin absorption. Replace aluminum or metal cookware with enamel-coated options, or old-fashioned cast iron pans. Check the labels on all food, medicinal, and hygienic products and avoid those with aluminum content. Don't drink from aluminum cans. Have your water tested for aluminum and other contaminants, and consider using a filter. Cut back on processed foods, as aluminum compounds may be added during the processing. Limit your intake of aluminum-containing antacids and buffered aspirin. Do you have other tips for avoiding aluminum exposure from personal care products? Please share. Photo courtesy ShiokDeal.com via Flickr.com. Darbre PD, “Aluminum, antiperspirants and breast cancer,” J Inorg Biochem 2005 Sep;99(9):1912-9, http://www.ncbi.nlm.nih.gov/pubmed/16045991. Keele University (2007, August 31). Aluminum In Breast Tissue: A Possible Factor In The Cause Of Breast Cancer. ScienceDaily. Retrieved June 19, 2012, from http://www.sciencedaily.com /releases/2007/08/070831210302.htm. “Antiperspirants and Breast Cancer Risk,” American Cancer Society, http://www.cancer.org/Cancer/CancerCauses/OtherCarcinogens/AtHome/antiperspirants-and-breast-cancer-risk. “Public Health Statement for Aluminum,” Agency for Toxic Substances & Disease Registry, September 2008, http://www.atsdr.cdc.gov/phs/phs.asp?id=1076&tid=34.